One of my favorite Canadian Food Network Shows is David Rocco's Dolce Vita. It is a great show that shows snippets of David's life and adventures in Italy. I'm pumped everytime I hear the upbeat theme music of his show, and of course, I love his food. In each show, David shows you how to make very simple Italian dishes that are effortless. One of my favorite recipes is his Cous Cous Alla Panzanella. It is a no-cook cous cous recipe that is easy and packed with great flavors. Instead of boiling his cous cous in water, David Rocco prepares the cous cous by soaking it in olive oil and tomato juice. I make this for lunch all the time, and with the amount it makes, I usually have enough to last me the entire week. 1. Place olive oil, 1/2 tsp salt, and canned tomatoes in a large mixing bowl. Add cous cous and mix thoroughly. 2. Add red onions, red, orange, and yellow peppers, and cherry tomatoes to the bowl. Mix well. 3. Add in lemon juice, and torn basil leaves. Mix well. Add pepper to taste (and more salt if needed). 4. You can serve immediately or wait a few hours for the flavors to intermingle. That looks really nice and healthy. I'll have to try it out for lunch. 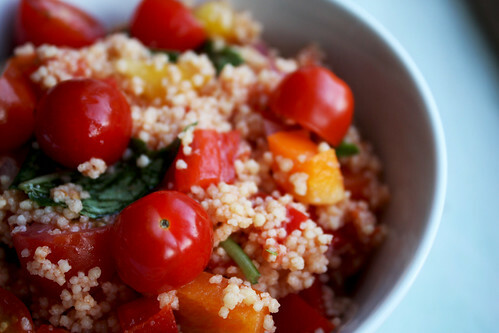 this looks really delicious, interesting that you don't even cook the couscous. question though - about how much is 40g of fresh basil leaves? I'd say a good handful of basil leaves would do. My advice would be to just add the basil leaves until it tastes right for you.